Twice each year, in June and September, the Squam Art Workshops take over the lakeside Rockywold Deephaven Camps in Holderness, NH. Founded in 2008 through the vision of Elizabeth Duvivier and now run by Meg Fussell, the biannual gathering boasts workshops taught by leaders in the fiber art and craft worlds, yoga classes, multi-use work spaces, and concludes with an exciting (read: packed, and a little sweaty) art fair featuring everyone's favorite indie vendors of the yarn and fabric varieties. I first heard about Squam (named for the sparkling lake that still requires a bit of bravery to plunge into in early June, which I obviously was powerless to resist) a little more than a year ago through various channels on Instagram. Makers I admired from afar were teachers and attendees alike, and all came home with glowing reviews of the transformative experience. haystack, 2011. not me, because i took this photo, but i definitely stood there too! It's been a whole seven years since I attended Haystack Mountain School of Crafts immediately after graduation with BFA in hand, anxious and uncertain and searching. Haystack was an essential part of my transition from student to working artist; I had the opportunity to work with and learn from established professionals, graduate students, and lifelong hobbyists on a literal island of a maker's paradise. Now, approaching 30 (excuse me, what? ), and somehow still similarly anxious, uncertain, and searching, I felt overdue for some cleverly veiled professional development. Creative growth masked as vacation, I was all in. My husband and I made a road trip out of getting me to NH, camping in Massachusetts one night and staying in a dog-friendly hotel in Concord the next, where Lottie had a bed to herself and was in a much improved mood compared to sharing my pillow in the tent. On the way, we ate sandwiches on the porches of small town general stores and I had the opportunity to tour the spinning mill at Harrisville Designs. Pro tip: the women I encountered who worked at Harrisville were absolutely delightful humans and you should totally pay them a visit. Day one at Squam is an easy-going meet and greet. I registered in the early afternoon, filling the official tote bag with freebies from generous sponsors- like a gorgeous skein of silk and wool yarn from Harrisville Designs and a sewing pattern that I had totally been coveting from Fancy Tiger Crafts. Yoga at 4- I made (and kept) a commitment to attend the offered yoga classes each day, which were gentle, restorative and perfect after a day of crafting- followed by dinner and the so-called Opening Ceremony. You have the opportunity to pick two classes to attend during your stay at Squam for days two and three (they try to honor you first and second choices, which is not always possible), and I landed myself in a cable class with Internet Knitting Hero Karen Templer of Fringe Association and Fringe Supply Co. as well as a paper/fabric cutting workshop with stitcher extraordinaire Tierney Barden. Karen's class was a good example of taking a class for the teacher and the enjoyment of the activity; I'm already a competent enough knitter (but as I told my class, there are always things that you don't even know that you don't know), but I did pick up a few tips sitting in a circle by the fire, looking out at the lake, constructing an entire hat; i.e. not a bad way to spend a day. With Tierney's class, I aimed to challenge myself with a technique that was unfamiliar to me, but still related to my practice as an illustrator and fiber artist. I took to her methods like a fish to water, and will be forever grateful for Tierney's generosity as a teacher. I filled the rest of my time attempting to work on my crazy self; I got up early and drew tarot cards on the dock, wrote, sketched, swam, and practiced being still in the twilight. 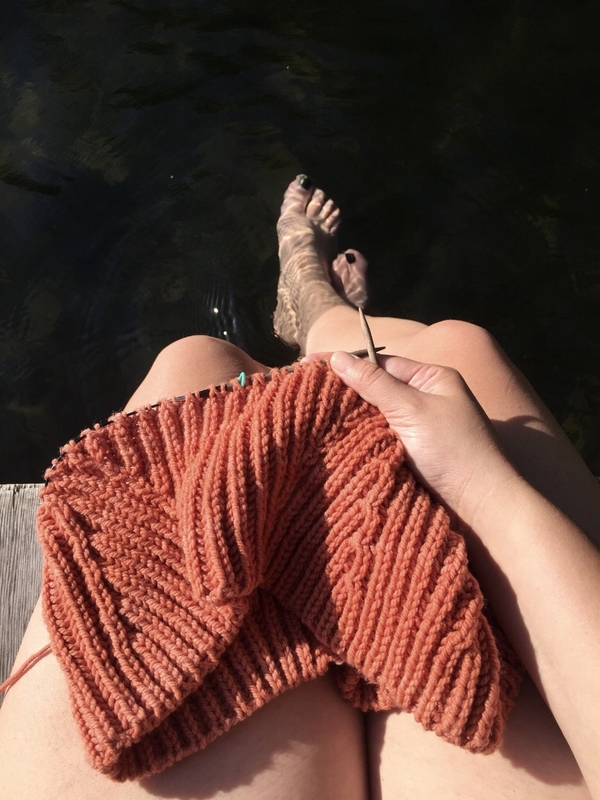 I did not cure myself of my social anxiety, but I did manage to show generosity towards myself for the time I needed to spend alone, away from the clicking of knitting needles and chatter. I attended a panel discussion featuring three small business owners. I did not attend the Journey Dance class. I wrote the following affirmation in my Saturday yoga/self-love workshop: "May I practice forgiveness and compassion for where I am on my own path." I can see why so many folks, mostly women, return to Squam again and again, and I'm so happy that I went. So thank you, Squam, for giving me a much needed break, a place to come back to if I find myself in need, an experience which I let wash over me, embrace me, and return me to my studio, ready to work once more. Special P.S. Lest you think I had all the fun once Bryan and Lottie dropped me off at camp, know that they hiked a few mountains and went kayaking in my absence, so, you know. A good time was had by all. I'm pleased to announce that I'm partnering with everyone's favorite Baltimore sewing shop Domesticity to teach an exciting tapestry weaving workshop. 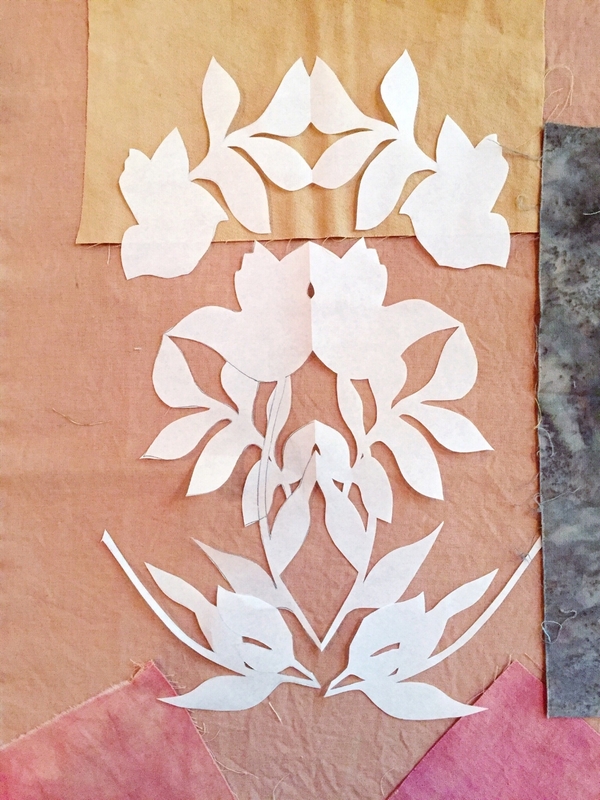 Come learn all the basics to create your very own wall hanging, no experience necessary. Register through Domesticity's class page (linked just above); space is limited so grab your spot today! I'm happy to announce that next Monday, February 12, I will be delivering a lunchtime lecture hosted by the MICA MFA in Illustration Practice program. I will be talking about the development of my studio practice as an interdisciplinary artist in illustration and textiles. This talk is free and open to the public.